Paul Sweeney comments "teaching is tiring" after my last post. I have to agree, as I plow my way through a pile of 60 final exams (400 pages in all) that I must grade singlehandedly. BU gives me 48 hours to submit grades after the students put down their pencils. Ugh. It's a pretty good exam, which makes the grading tolerable. If you're bored this Christmas weekend, give it to your kids and let the fun begin! Thanks also to Simon Clay Michael for teaching me the handy phrase "Merry Mazel Tov." It is intended to join, complement, and spur other efforts to capture and make widely available what is being learned in the business, government, and civil sectors about why and how to use networks, rather than solitary organizations, to generate large-scale impact. We start with the point of view that networks provide social-change agents with a fundamentally distinct and remarkably promising “organizing principle” to use to achieve ambitious goals. Given the complexity and enormity of social problems, the unrelenting pressure to reduce the cost of creating and implementing solutions, and the recent proliferation of small nonprofit organizations, networks offer a way to weave together or create capacities that get better leverage, performance, and results. But something new and important is afoot. The nonprofit and philanthropic sectors are under growing demand to do more and to do better. The number of nonprofit organizations is expanding substantially, as are the tasks the civil sector undertakes in light of government downsizing. “We’re seeing growth of nonprofit organizations, but not much change in the systems they are trying to impact,” says Pat Brandes, a foundation executive in Boston. Nonprofit capacity is a “chronic problem,” writes Jonathan Peizer of the Open Society Institute. “The sector must embrace new paradigms.” Gideon Rosenblatt, executive director of a Seattle nonprofit and a former Microsoft senior manager, notes that “many environmental leaders are questioning whether the environmental movement has the right strategies and organizational structures in place.” The movement, he contends, has “over-invested in institutional overhead” and “is replicating board development, fundraising and many other functions across thousands of very small organizations.” It is essential, Rosenblatt concludes, to “un-bundle” and rebuild the environmental organizational structure using network approaches. Foundations, a crucial capital market for nonprofits, and governments that contract with nonprofits increasingly seek improved impact, leverage, and “return on investment.” Nonprofits are routinely expected to be more strategic, entrepreneurial, and “high performing,” and to focus on producing outcomes. Some efforts to increase the impact of nonprofits, such as “venture philanthropy,” have focused on strengthening individual organizations to be more effective and efficient. But, as the Maine Community Foundation notes, this approach can be inefficient, since its capacity-building resources are invested across many organizations without regard for redundancy and overlap among the organizations. Meanwhile, foundations typically fund programs rather than methods of delivery, but more of them are forming their own networks, rather than going it alone, to develop their strategies and pool their resources. Most of us have networking in our blood. We build personal networks and connect with other individuals or organizations to get things done that we can’t do by ourselves. But there’s much more to network building than this instinct to link. 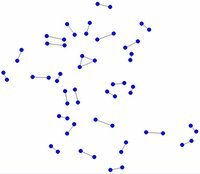 Building a network is a practice about which much has been learned from the experiences of network builders themselves and the experiments and insights of researchers in mathematics, physics, anthropology, and other disciplines. This is news to most of the social entrepreneur-network builders we meet. Networks in the nonprofit sector are rarely organized to take full advantage of what networks can do. “We in the nonprofit sector always say, ‘We connect,’ but we don’t really know much about connecting,” observes Marion Kane, executive director of the Barr Foundation. For many decades, the overriding organizing principle of the social-change sector, as with business and government, has been the stand-alone organization. This focus has driven the understanding of management and leadership; the CEO or Executive Director at the helm of the lone organization has been an icon of the age. But hierarchical, organization-centric is losing its sway. Many people, even in the largest, most venerable organizations, recognize now that to gain greater impact they have to let go of organization-centric ideas about how the world works, and they are adopting network-centric thinking. 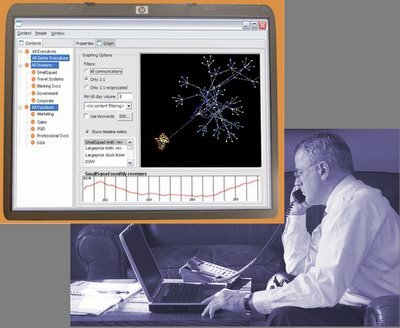 Part I: Is a Network Approach Right for You? Peter Plastrik is president of the nonprofit Innovation Network for Communities and a consultant to foundations, nonprofits, and social enterprises. He is co-author of two books about reinventing government, Banishing Bureaucracy and The Reinventors Fieldbook, as well as numerous articles about innovations in government and economic and community development. Madeleine Taylor is a social anthropologist who advises public and nonprofit organizations and national foundations on strategy, research, program development, and evaluation. She is a co-founder and Principal of Arbor Consulting Partners, a research and consulting firm in Boston. Suppose there were an investment fund that doubled any money deposited in it. (Please keep reading, this is not Nigerian spam.) This fund has only one catch: After receiving (confidential) deposits, the doubled-value fund is evenly divided amongst all investors, regardless of their initial deposits. How much would you invest in such a fund? The answer clearly depends on how much everyone else is going to invest. Can you trust your co-investors to put in at least as much as you do? 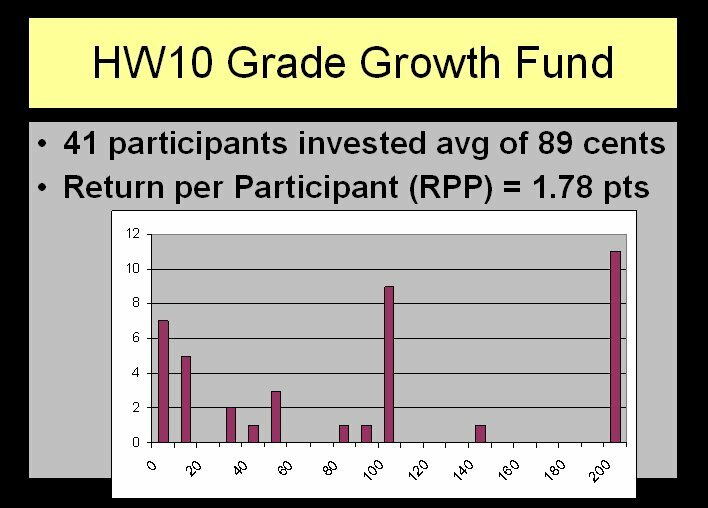 A few weeks ago I invited my students to participate in this experiment by investing their hard-earned grade points in exactly such a fund, as a homework exercise (HW10, to be exact). To protect against individual ruin, I limited the maximum investment to 2 points out of 150 earned over the course of the semester. By requesting deposits in "cents" (0.01 of a point), I gave students a range of 0-200 to choose from. Here are the results. You can see that many students chose to invest 200 cents (the maximum allowed) but there were enough free-riders in the fund so that even after doubling, the fund returned less than 200 cents to each investor. In other words, many students lost 0.22 points by investing in the fund. Claire Reinelt alerted me yesterday to German researchers B. Rockenbach and M. Milinski, who did a very similar study and got their results published in Nature just this week. Their study also allowed fund investors to dedicate a portion of their deposit to punishing free-riders on the fund. This option turns out to be a critical ingredient to designing a fund with maximal collective gain. See also this cute Boston Globe article on the study: "Want cooperation? Carrots and sticks get the best results." Yesterday was the last day of classes for the Fall 2006 semester at Boston University. Thus concludes the journey of creating the new course, "Online Social Networks," with my wonderful first group of students. I miss them already. The following two student essays do a great job of digesting the material of the semester and addressing the question, "does the Internet make future social epidemics more or less likely?" Here is an excellent essay on how the Internet increases epidemics, written by A Garrett Robertson. Today I am very busy preparing my first ever lecture at Boston University, where I am about to teach Online Social Networks under the guise of "CS-103: Introduction to Internet Technologies and Web Programmming." Conveniently, last Sunday's NY Times Arts & Leisure section supplied me with my lecture material. Check out this wonderful front-page article on how traditional music experts (FM radio program managers, record label talent artists) are losing power and influence to online services. 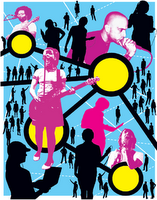 Strangely, the front page graphic features a social network map, even though Pandora.com, the most prominent online music service in the article, is not really driven by social network technology. See The Music Genome Project for more. The Connectedness staff is back at the blog after a wonderful summer vacation. While resting at the Omega Institute, I got a hoot reading Gordon Wood's pithy history, The American Revolution. I have been addicted to founding-father bios for a few years now. Reading this high-level overview of the period gave me new clarity on the hook of my addiction: The American Revolution is arguably the greatest organizational development case study of all time. This realization put a bit of a damper on the idea that I was actually vacationing, but I enjoyed the epiphany nonetheless. British disadvantages [in 1775] were immense and perhaps overwhelming.... A well-trained army might have been able to to conquer the American forces, but... America itself was unconquerable. The great breadth of territory and the wild nature of the terrain made conventional maneuverings and operations difficult and cumbersome. The fragmented and local character of authority in America inhibited decisive action by the British. There was no nerve center anywhere whose capture would destroy the rebellion. The British generals came to see that engaging Washington's army in battle ought to be their main objective; but, said the British commander in chief, they did not know how to do it, "as the enemy moves with so much more celerity than we possibly can." Netwar is an emerging mode of conflict in which the protagonists use network forms of organization, doctrine, strategy, and technology.... The practice of netwar is well ahead of theory, as both civil and uncivil society actors are increasingly engaging in this new way of fighting. 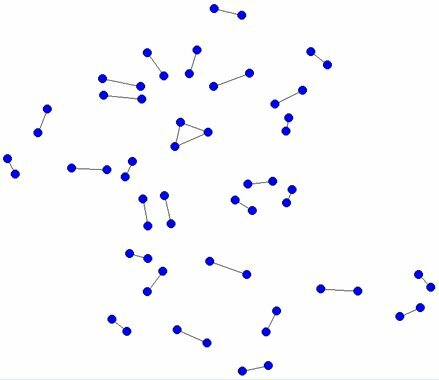 Social network analysis is often discussed as a way to see "how an organization really works." Less often do people acknowledge that "how an organization is changing" is often even more important than "how it is working." SNA researchers are hard at work developing ways of measuring change (typically under the name of "longitudinal studies"). 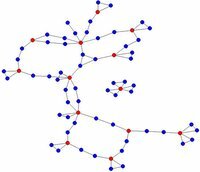 Unfortunately, in a field that already suffers from interesting but hard-to-use technology, longitudinal methods of SNA are even more difficult to grasp and apply than their static snapshot counterparts (by a wide margin). All that makes it even more impressive that the Accenture Institute for High Performance Business, led by Bob Thomas, has produced a relatively accessible dramatization of how real-time dynamic SNA can be a powerful business tool in the not-too-distant future. I had the privilege of creating this seven-minute Flash video for Bob, in collaboration with Sarah Maloney of Accenture, Paul Trevithick and Mary Ruddy of Parity Communications and Barry O'Brien of North Shore Communications. You can see our handiwork here. As I mentioned in a post on jerks and fools at the office, negative relationships often influence the big picture more than their positive counterparts, and the study of negative-valued social networks is still underappreciated. Professor Joe Labianca is one of the researchers working hardest at "balancing the ledger" to understand social networks that include negative as well as positive relationships. Asking someone to name his sworn enemies amongst his co-workers might be impractical. But in "no holds barred" arenas (love, war, etc.) mapping negative relationships is sometimes feasible and almost always more revealing than mapping positive relationships. 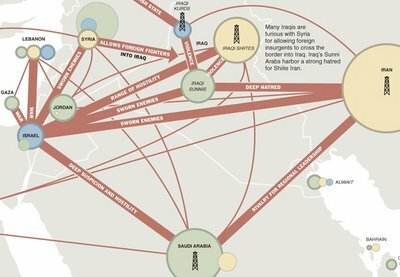 Just take a look at these network maps of political scandal previously published by the NY Times to see how lame positive-valued network maps can be in comparison to the Middle East map of hatred, above. 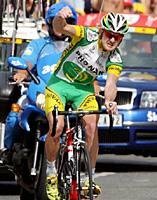 Landis, among the initial favorites to win the Tour de France, seemingly fell from contention yesterday when he "bonked" and lost over ten minutes to his rivals. But today Landis more than rebounded. Singlehandedly, he rode away from everyone and took back all that time (all but 31 seconds). With one time trial stage remaining, Landis must now be considered the Tour de France favorite once again. Such over-the-top displays of individual athleticism are rare in the Tour de France, where winners typically succeed only thanks to behind-the-scenes sacrifice by their teammates. During last year's Tour de France, I said of cycling that "few Americans appreciate the team dynamics and strategy that are the heart of what road racing is about." It's a sport sophisticated enough to inspire 21st century innovations in the mathematics of game theory. Nothing was remotely subtle, sophisticated, or behind-the-scenes about Landis's strategy today. Are you networked for successful innovation? MIT Sloan Management Review recently published "Are you networked for successful innovation?" by Professor Polly Rizova of Boston University. 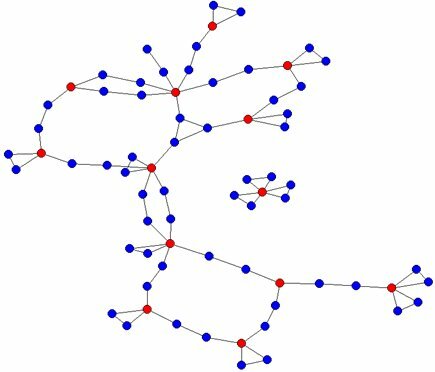 Interestingly, Rizova also looked at information-sharing networks and friendship networks, and found these much less relevant than the factors listed above. Rizova acknowledges that these four factors alone are not enough--they must reinforce each other in order to work. She goes on to discuss the complementary values of the technical-advice and organizational-advice networks, and how people's actual roles in these networks can help inform their explictly prescribed roles in the organization. This article is a must-read for leaders of R&D units. It's also a great SNA case study for those wondering exactly which social networks are relevant to their organizational goals. This is one of the hottest questions going in the ONA community of practice (which spawned from the SNA Jump Start conference). For a good follow-up case study, see also David Krackhardt's HBR classic about technical-advice and trust networks. Thanks to Francesca Grippa for alerting me to this article. Yesterday the Italians won the World Cup, but the bigger story is the exuberant return of German patriotism. I am not old enough to remember the Third Reich or the rise of the Iron Curtain, but I was just graduating from college when the Berlin wall came down. What a happy day that was. Today seems like an even happier day for the Germans -- while the rest of us get to be happy for them. Congratulations! Germany's recovery comes well-timed to keep my spirits up when a community dear to my heart has just taken a bit of a beating. Several years ago, after a long period of searching and reflection, I joined a Unitarian Universalist church. My growth from cross-armed skeptic to active community member is one of the great healing gifts of my life, a gift I received thanks to three people in particular -- Thomas Mikelson, Chris Bell, and Rita Butterfield. In the past month, I have bid farewell to all three of these champion network weavers. Thomas retired in June after 17 years of leading our church. That same weekend, our congregation ordained Chris -- one of our long-time members, and a recent divinity school graduate. Now Chris is taking his immense talents and his wife Rita to Santa Rosa, CA, where he will lead his own church. Yesterday I saw Chris and Rita for the last time. Farewell, Thomas, Chris and Rita! We will not be the same without you. Recently I poo-pooed the "dawn of emergent collaboration" (a phenomenon older than civilization) and said I was much more excited about the resurgence of "user-driven technical invention." "Empirical research is finding that users rather than manufacturers are the actual developers of many or most new products and services – and that they are a major locus of innovative activity in the economy. This finding opens up new questions and avenues for exploration in fields ranging from economics to management of technology to organizational behaviour to marketing research. Examples are patterns in innovation by users, characteristics of innovating users, design of a user-centered innovation process, economics of a distributed innovation process that includes users as innovators, and social welfare implications of innovations by users. "We have set up this website to provide a convenient repository for papers on topics related to innovation by users. Our goal is to establish a community in which research information related to the topic of user innovation can be freely exchanged." Thanks to Bob Wolf for introducing me to the work of Karim Lakhani. Yesterday's celebratory quote of Thomas Jefferson received a thoughtful reply from Suresh V, reminding us that the author of The Declaration of Independence was a lifelong slave-owner. Suresh is much more polite in his criticism than Jefferson's contemporaries were. Foremost among the Jefferson-bashers of history is Alexander Hamilton. Though not as celebrated as Jefferson, Hamilton arguably had even more influence in shaping the modern United States of America. You might say that Jefferson planted the seed of the American Revolution and Hamilton tended the resulting garden. "If [I] had wanted to impose a monarchy upon America, [I] would follow the classic path of a populist demagogue: I would mount the hobbyhorse of popularity, I would cry out usurpation, danger to liberty etc. etc. I would endeavour to prostrate the federal government, raise a ferment, and then ride in the whirlwind and direct the storm." This vicious debate between Jefferson and Hamilton reminds me of today's debate over net neutrality. In one corner, we have the paragons of online populist democracy, led by Google. In the other corner, the titans of industrial Internet infrastructure, such as Comcast. In contrast to some of my blogger friends who support net neutrality (e.g., Bill Ives, Mal Watlington), I am glad that the government has so far refused to prohibit Comcast and other telcoms from instituting preferential pricing schemes for access to their Internet networks. 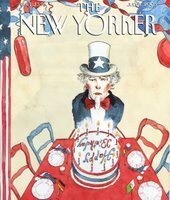 With lobbyists from Google now crying "antitrust", I think we have reason to suspect that net neutrality--as it is argued in Washington, anyway--is as much about protecting the Google-Amazon-eBay oligopoly of social commerce (as reported in "Going Long" by John Cassidy in today's New Yorker) as it is about protecting individual life, liberty, and pursuit of online happiness. Which mega-corporation are you cheering for? Eric Mattson called me from Sweden last week to continue his quest to conduct 1,000 podcast interviews. You can listen to the result here; I hope you enjoy. Eric and I had fun, anyway. Eric's post includes links to UCINET, InFlow, TeCFlow, and NetMiner. In hindsight I should have also given him the link to VisiblePath, which I described at length in the interview. BTW, I won't be offended if you listen briefly and then get frustrated with my slow talking. If that happens, just check out this other podcast interview of me, which was accelerated by an audio compressor in order to present me in a more fast-talking style (with less about software tools and more about bridging and bonding forms of social capital). Podcasting in general is something I am not keeping up on, with the singular exception of Tony Kahn, who produces and directs the Morning Stories podcast for NPR. It's a funny and touching look at everyday people. Updike's essay is going to get beaten to death on the blogosphere over the next few days. Tune in to Technorati for a live view of the action. My favorite response to Updike so far comes from journalist Jason Chervokas. "Authors, if I understand present trends, will soon be like surrogate birth mothers, rented wombs in which a seed implanted by high-powered consultants is allowed to ripen and, after nine months, be dropped squalling into the marketplace. "In imagining a huge, virtually infinite wordstream accessed by search engines and populated by teeming, promiscuous word snippets stripped of credited authorship, are we not depriving the written word of its old-fashioned function of, through such inventions as the written alphabet and the printing press, communication from one person to another — of, in short, accountability and intimacy?" My favorite part of the essay is the amazing metaphor of "authors as surrogate mothers, rented wombs" owned by "high-powered consultants." Wow! The only issue I take with that disturbing image is the implication that consultants are more mercenary than authors. In support of Updike's main point (which applies equally well to all kinds of people, including both consultants and authors), see this post on viral marketing, which describes the alarming ease with which we rent out our creative wombs, as reported by this NY Times Magazine cover story. Updike then claims that the Internet has stripped the written word of "accountability and intimacy." Like Updike, I do believe we are experiencing a substantial decline in accountability and intimacy. I also agree with Updike that the Internet has something to do with this decline--a contentious argument among sociologists that has recently captured front page headlines. But before we demonize the Internet and raise up our books, it's worth noting that books have also been criticized for alienating us from intimacy--ranging from Julia Cameron's argument that book-reading inhibits our inner artist to Leonard Shlain's thesis that literacy itself has fed a millenia-long hegemony of patriarchal intellectualism. Once again, Updike betrays his personal interest in books and authorship by ignoring their dark side. On a final uplifting note, know that as long as brilliant writers like Updike write essays titled "The End of Authorship," we can rest assured that the institution of authorship remains secure. The nightmarish end of authorship will only truly happen when Updike gives a s**t what his Google rankings are--a lovely paradox I touched on recently in a post inspired by John English's The Economy of Prestige. The number of people who have someone to talk to about matters that are important to them has declined dramatically. [Between 1985 and 2004]... we have gone from a quarter of the American population being isolated ... to almost half of the population falling into that category. Whatever the reason, it appears that Americans are connected far less tightly now than they were 19 years ago. See also today's Washington Post for similar news coverage. There is more to being “very close” to a person than being a confidant discussing important matters. Having frequent intimate contact — whether in person or online — and providing help to each other clearly play roles. Long ago I put my own two cents into this debate: I share Putnam's concern and furthermore find it striking that amidst so much decline in community, two venues where American socializing is actually increasing are self-help groups and the Internet. 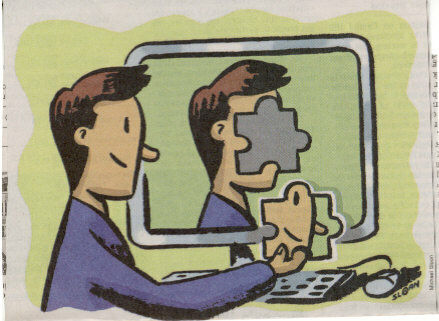 I call this the "Cross Talk Crisis"; Barry Wellman more optimistically calls it "Networked Individualism." Today is the second anniversary of Connectedness. Sadly, it also marks the end of our two-week party on the "Blogs of Note" list, so our birthday celebration has a few empty seats, relatively speaking. Even so, I have a lot to be happy about. 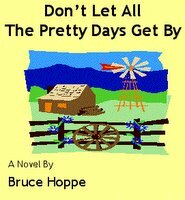 For example, I recently discovered an up-and-coming novelist by the name of Bruce Hoppe. His debut, Don't Let All the Pretty Days Get By, reminds me to enjoy the moment. To learn more about this "post-modern romp through the new West," you will want to be very clear on the difference between me and my namesake at Back-to-One Books. Andrew McAfee heralds "Enterprise 2.0: the dawn of emergent collaboration" in the Spring 2006 MIT Sloan Management Review. It's a good overview of how businesses can make the most of blogs, wikis, and RSS web technologies. I recommend you check it out--despite the article's pretentious and misleading title. My main complaint about the article is how McAfee associates SLATES with "the dawn of emergent collaboration." People have been practicing emergent collaboration ever since we dropped out of the trees and learned how to walk and make tools. See Marcel Mauss' 1924 research on "functions of exchange in archaic societies" for (pre-) historic background and Mary Parker Follett for organizational application of similar principles, also written in the 1920s. "The separation of technology design and implementation in time and space dramatically reduces the opportunities for meaningful “user” participation in the change process…. Technology designers have little incentive to solicit input from those who are the object of change. As a result, new technology frequently confronts the rest of the organization as an exogenous force—one that can be countered only through overt political action." The 1995 separation between technology design and implementation has visibly dissolved in McAfee's 2006 world of SLATES--and I think that is pretty exciting... Rather than type any unseemly exclamation points at this point, I refer you to this podcast where you can hear me panting about this revolution in the making. Now all we need is a better descriptor than the way-overused "2.0" suffix.